A recipe for tender country-style ribs baked low and slow in the oven over a bed of onions. I’m not sure if you can get country ribs in your neck of the woods but, Lord, I hope so, because they are so good and versatile and cheap! 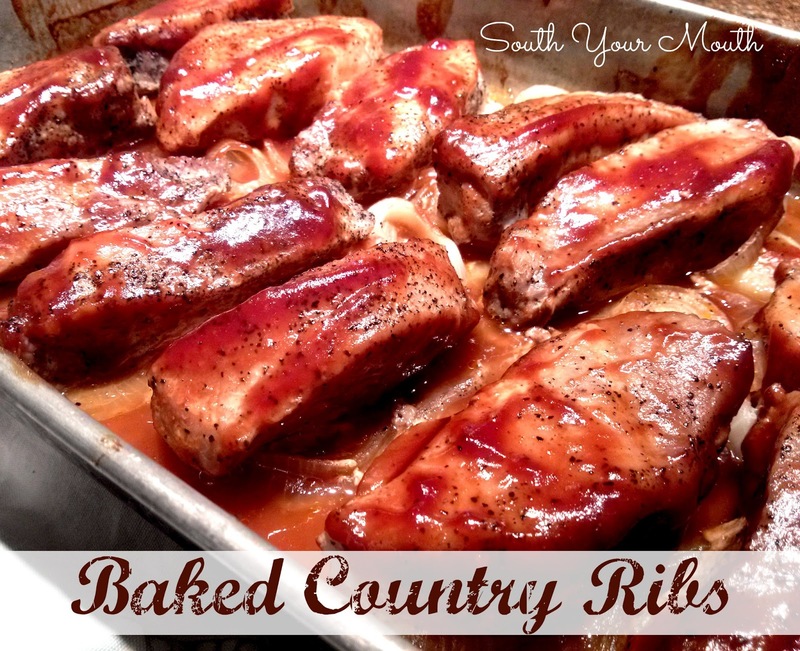 Country Ribs (sometimes referred to as “country-style” ribs) are just slabs cut from the sirloin or rib end of the pork loin which are cut into rib-shaped slices (most often boneless). I use these in my very favorite pork recipe, Honey Dijon Marinated Pork Kebabs. Anywho… when I’m looking for a no muss, no fuss meal, I love to throw these in the oven, let them cook low and slow then douse them with barbeque sauce at the end. They are tender as butter and will just fall apart if your fork even looks at them hard. And they’re impossible to mess up. This is also how I cook traditional ribs though I season them with a little dry rub and then finish them off on the grill so the barbeque sauce can get extra happy. Arrange onion rings evenly in the bottom of a 10x14 baking pan (these keep the ribs off the bottom of the pan and prevent them from boiling rather than slow-roasting). Combine water and Liquid Smoke (if using) and pour into the bottom of the pan. Season ribs liberally with salt and pepper on all sides (feel free to jazz up your spices but I tend to like plain ole salt and pepper on these). Arrange ribs evenly over onion slices. Cover pan tightly with aluminum foil or a tight-fitting lid and bake at 250 degrees for 3 hours. Remove ribs from oven and increase temperature to 400 degrees. Pour off all liquid and reserve for Greasy Rice if desired. Baste ribs with your favorite barbeque sauce and cook for 10-15 minutes or until sauce is heated through and starting to get a little sticky. Oooo honey, I am excited to try this Greasy rice stuff! Hand to Jesus! Thankfully in MN we do have "Country Style" ribs. We don't have Palmetto bugs. Personally I think that makes MN way more awesomesauce. Ha! If you're nice to me, I'll teach you my homemade rub and you can try using just that and no BBQ sauce some day when you're feeling all nostalgic for the upper mid-west. Which I'm sure happens all the time, right? Yah- knew it! "Hand to Jesus!" HAHAHAAAAAAAAA Ima have to steal that! This whole post ... Including the comments ... Made me giggle! Hand to Jesus! Haha. I'm gonna try these ribs they look great. Hope we can get them over here in MI! LOL! Glad you found your way here! Good luck with the ribs! Just curious...my hubby LOVES country ribs and I LOVE my crock pot...do you think these could be done like this in my crock pot? Hmmm... Even at a low 250°, it's just too hot down here in Florida to turn the oven on! ugh :( Thanks! Sure! I'd cook them on low for 6 hours or so? Let me know how they turn out if you try it! I do baby backs in the crockpot all the time. They come out falling apart tender! I've made them in the slow cooker and they are really good,especially if you shred them for pulled pork sandwiches and they're less expensive then a pork roast. Ok, so I made these for dinner tonight and they were great...nice and tender, didn't even need a knife to cut them. I will be making them again! I am only cooking for myself and have just over 1lb (4 ribs) of the pork loin country style ribs so my question is, how long would I have to cook them? Thank you for your help! When the ribs come out for basting do they get covered again or leave uncovered for the 400 for 10-15 minutes? They go back in uncovered. I want to thank you for this recipe. I am eternally grateful it was here to find. But, let me tell you - I did not follow all of the recipe. I only used the method of baking (200 for 3 hours) and the drippings enhancement of chicken stock and water. My daughter will not eat anything that has barbecue sauce on it. She hates even the smell of it. So, I found a dry rub recipe elsewhere and made that, rubbed the ribs down, put them in the baking dish and into the 200 degree oven covered with foil. I forgot the stock, so after an hour and a half, I put 1 cup of stock made from dried bouillon granules and water and recovered the dish and finished baking the ribs. When the timer buzzed, I shut off the timer and the oven and allowed them to sit in the still hot oven while I made the side dish of pasta, cheese and broccoli. (My daughter also won't eat rice.) OMG! First of all, I had never bought ribs like these before. Secondly, I had no clue how to cook them, so my thanks go to you for that. Thirdly, they were as tender as butter!! Last of all, the fragrance drove our cats completely out of their little cat minds! They'd have climbed into my mouth if they could have. As for the greasy rice - I have saved the drippings and added water for the 2 cup measurement and will be making the rice tomorrow for myself. I've always loved rice, with gravy, fried, in pudding, stuffed in peppers, Spanish style, arroz con pollo, etc. But, greasy rice I haven't tried and I plan to. Thank you!!! Do you cook 4 pounds the same amount of time? Yes, so long as they're in a single layer. Making ribs step by step.... just curious on how to make the rice can u plz let me know? I make these all the time....they're so good! I sometimes toss 'em in the slow cooker, then take 'em out, brush the sauce on and put them under the broiler for a minute or two. My heavens! I just made these last night. With the greasy rice. I had a very serious religious experience with these ribs. It was sinfully delicious! how can i fix dry ribs? What can i do with them to finish eating them? The only thing I can think is that the ribs might have been too lean. Did you use country ribs or another cut of meat? I don't know where you are located Kurt, but here in south Mississippi country ribs can be either pork shoulder or pork loin. Pork loin would be more of the "white" meat and pork shoulder the "dark" meat. Look closely at the package and it should say which it is. IMO this recipe works better with pork shoulder country ribs. Mandy, you are a God-send. I found your recipe and tried it 6 months ago. Love it. Better than my dad's when I was a child. I like to roll the country style ribs around in a rub mixture and bake for 3 hours. I am thinking about trying some more of your recipes. You know, my only question is why the #$%^&* did I wait so long to make these? Didn't change a thing; even made the greasy rice. I cheated a bit on that, as I had some left over rice cooker-cooked long grained rice that had been drying out in the fridge. I just steeped that in the meat juices. Oh my word; hand to Jesus is right. I have shared your recipe to an on-line group, Foodfantaholics. My other side was Pinto Beans cooked under pressure. Man o man, thanks for posting the recipes! I made these and my God in Heaven, I will NEVER cook Country Ribs any other way EVER. Tender and deliciously flavorful! LOVE! Thank you for the fantastic recipe. 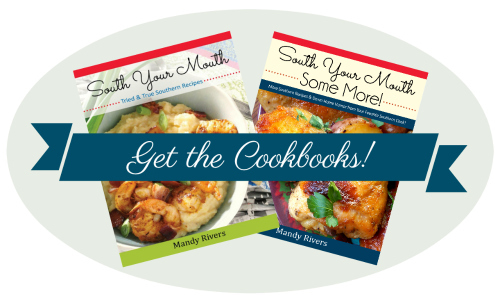 Mandy, thanks for such a great recipe. This Northern boy loves low and slow but the path to the grill is a little chilly right now. A bit of applewood rub and my homemade BBQ sauce (low sugar I might add) is a perfect addition to the Paleo diet my Mrs. and I are following. Working on our beach bods! Delish! Thanks again. can I cook country style beef ribs the same way? I would think they'd be great! I'm so happy to hear that you enjoyed the ribs! These were the best pork ribs I have ever cooked in my 71 years! Thank you so much!